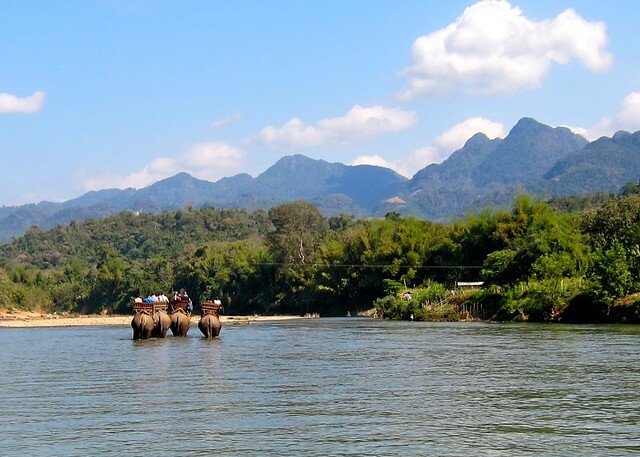 Cultural excursions in Luang Prabang – snackettes. We’re a bit behind on the blog these days, trying to wrap up our time in Laos (we’ve been in Thailand for almost 2 weeks now! ), so these next couple of posts are going to be short and to the point! 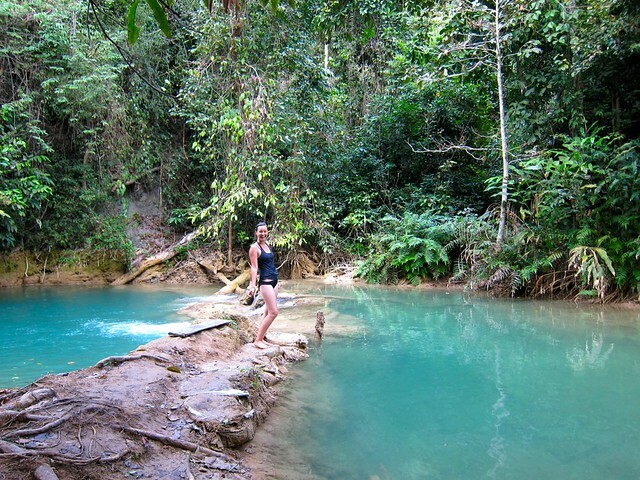 To round out our time in Luang Prabang, we did two really interesting, very different, touristy activities. First off, we spent a full day with some adorable elephants that had been rescued from the logging industry and were now living in a little haven just 10 miles from Luang Prabang. We had signed up for their “Mahout (elephant trainer) For a Day” class, so we spent the first part of the day riding on their necks, learning to steer them (you basically yell a command in Lao and kick them in the ear!). The cutest part was learning how to mount and dismount the elephant – we kicked her leg to let her know we wanted to come up, then she’d raise her little knee up to help us up, similar to an elevator. So cute! Riding them around without any harness was much harder than you’d expect – we basically had to wedge our knees against their ears as best as we could and squeeze with our thighs around their necks to hold on. I was shifting around back and forth each time her shoulder blades moved behind me as she walked, and I felt like I was constantly about to fall. Next, we were given a leisurely ride in a basket on her back through a river and some of the mountainside. 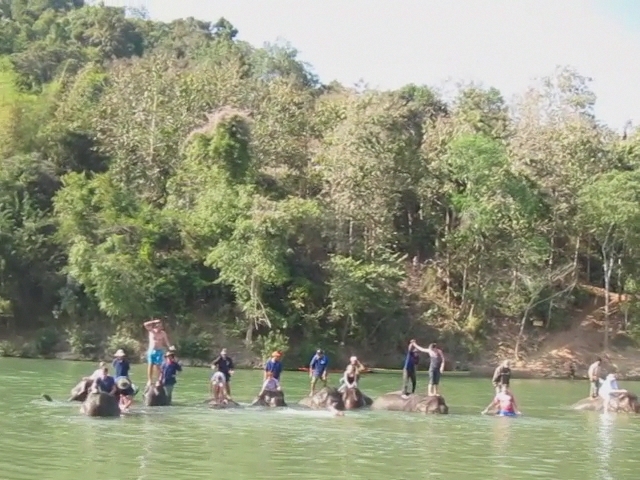 Finally, we were allowed to bathe our elephants in the river. 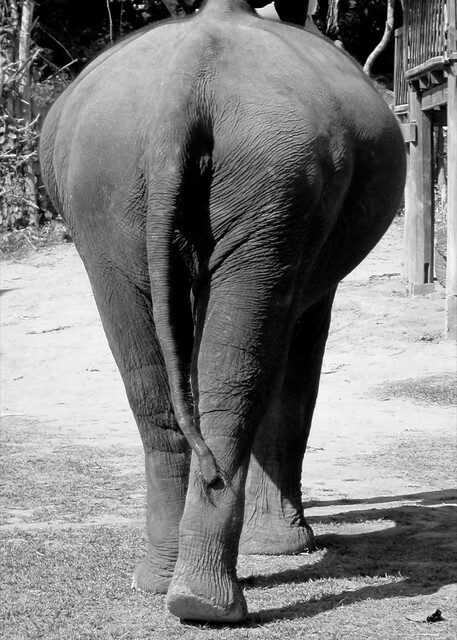 The description of the class we signed up for was a little misleading, as we were told we’d spend the entire day caring for “our” elephant for the day. 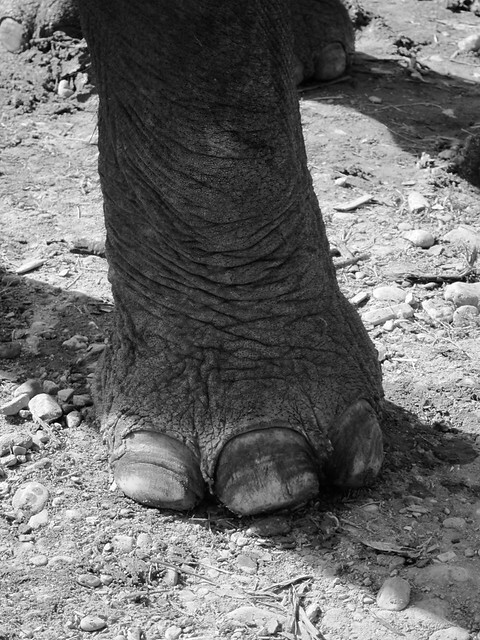 In the end, we were assigned several elephants throughout the day and it was pretty harried and impersonal. I can’t complain though – we each got to ride one of the many elephants into the water and give them a scrub-down on their fuzzy little heads with a toilet cleaner brush. 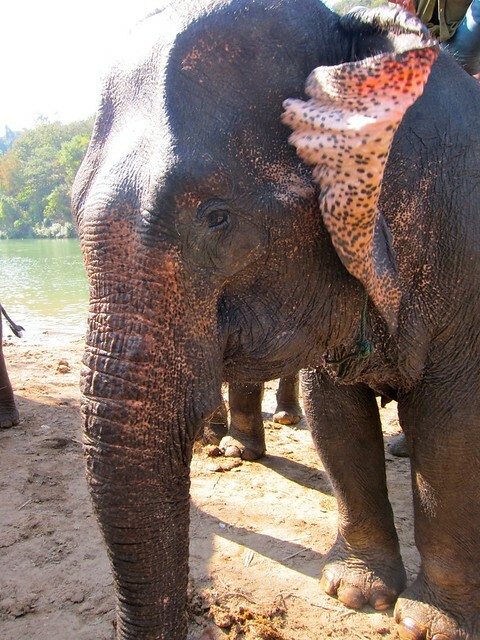 I was happy just cuddling my elephant on the ears and petting her rough back, but my Lao helper was pretty insistent that I should stand up on the elephant’s head for the majority of the time. Video: me, standing in grey; Scott, sitting on the far left (apparently his elephant was a whole lot more rambunctious than mine, and standing on her was just not an option – just trying to stay sitting on it was a workout enough, he said!). 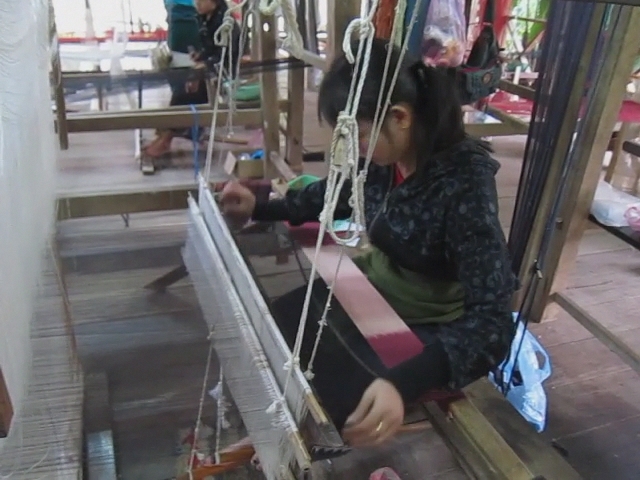 A couple of days later, we decide to take a half-day class with a local store, Ok Pop Tok, to learn more about the Lao silk and weaving industry. We were given an overview of the silk-making process (from moth to silk threads) by our guide. He then gave us a tour of their factory, where “master weavers” wove intricately-designed pieces of cloths on looms. It’s hard to convey how complex the weaving process was – frankly, we didn’t entirely understand what was going on, as it was so fast! Basically, a pattern for the the final piece was somehow “laid out” in the vertical direction of the loom; the pattern would then get transferred onto the final product by the weaver as they worked the loom. Due to their intricacy, many designs can only be set up by the “master weavers”, who are visually and mathematically skilled (and apparently it can take up to 30 years to become a master weaver!!) Once the loom has been set up by the master weaver, the design can then be woven by any number of “lesser” weavers. 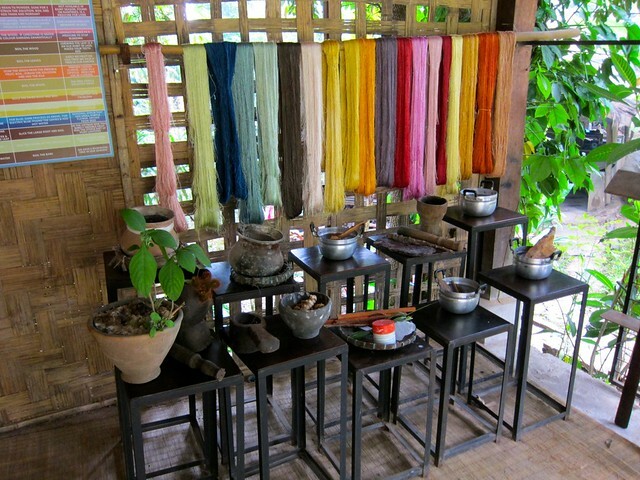 Next we were each allowed to pick 3 different colors that we would try to replicate on some silk skeins and cotton scarves. 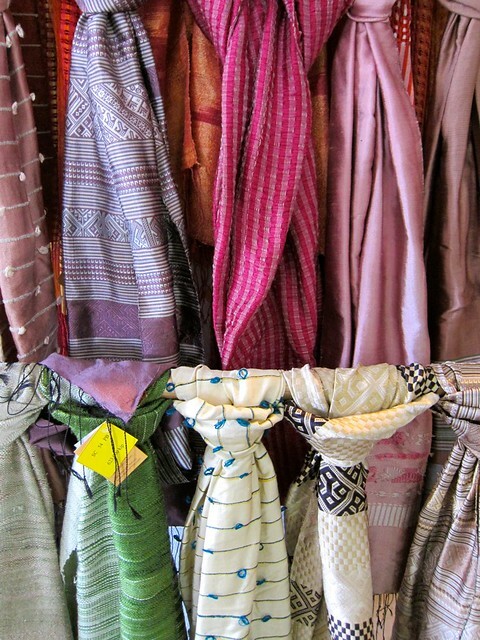 The end result: two beautiful cotton scarves and 4 silk skeins to take home! After everything we had seen and done in Luang Prabang, we decided it was time to move on to the next town. 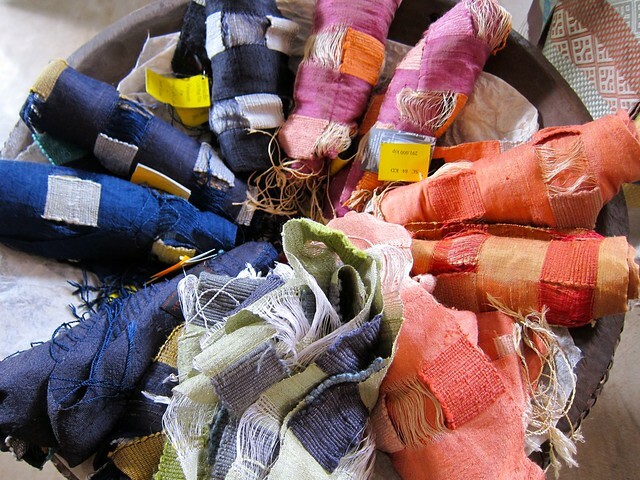 Next up: farther north and farther off the beaten path, Nong Kiaw, where elephant rides and natural dyes are simply a way of life!